On Cinnamon Buns; a discussion. I was at the mall this afternoon with a friend of mine, and on our way out we smelled something we all know and love, and hate to love. 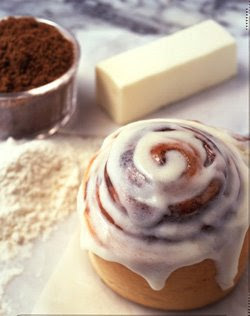 Yes, kids, that would indeed be Cinnabon! My friend told me she’d buy us a Cinnabon if I shared it with her. I couldn’t say no. Once you smell that delicious aroma, there’s no resisting. Yes, they’re 750 calories, according to Wikipedia, but hey! You only live once! I savored that gooey goodness. It was utterly oozing with buttery cinnamon and glaze. The dough in the center was just as I remember from when I was a kid: warm and soft! You know what Mitch? They do sell them! You can also buy candles or fragrance oils. You can even buy cinnamon bun scented perfume, in case you want to be eaten by random passersby! Oh science, you have made my life just a little more enjoyable. How about history? Where do these scrumptious pastries come from? Well, I don’t have any answers for you. I’ve seen lots of sources (ranging from credible to not-so-credible) talk about the origin of the sticky bun being Northern Europe. I read somewhere that they came to America via Pennsylvania from Germany. I’ve read that they come from Sweden, and in fact October 4th is national cinnamon bun day in Sweden (Our national sticky bun day is February 24th). None of these facts come from 100% reliable sources, and it is indeed a difficult thing to do, tracing the origin of a specific food. Foods evolve organically, depending on what foods are grown where, politics (which nations are doing trade with which? ), and chance. I mentioned Pennsylvania in the previous paragraphs, and it should be noted that Pennsylvania has its own style of cinnamon buns–they include raisons. Lets talk now about what a sticky bun actually is. Historically, sticky buns are sweet dough rolls, cut, with spices (not always cinnamon). Historically, the “sticky” part of the name came from the fact that the method of keeping the buns from sticking to the sides of the pan was to douse the buns and pan in syrup. Yeah, that sounds sticky! I know you’re all saying: when is she going to tell us what Alton Brown says? That’s right now, folks. Here is the link to the second part. Of course, he also talks about making cinnamon buns. Basically, combine ingredients in a stand mixer (I REALLY NEED ONE), let rise, punch down and roll, fill, cut, let sit overnight, proof, bake, gobble. Gobble. Gobble. One last thing. 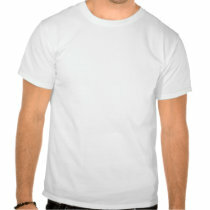 Check out this great t-shirt from zazzle.com! Love it! Yeah, I'm kind of a nerd.